The unbelievable comfort of Stirrup Heelrests is now available for Metric Cruisers. This adjustable height heelrest allows footboard-like support to reduce fatigue on longer rides. 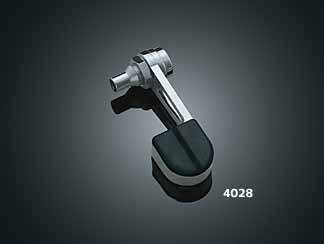 Kuryakyn ISO-Stirrups for Metric Cruisers are compatible with Large ISO-Pegs, Dually ISO-Pegs, Retro Pegs, Sweptwing Pegs and Flamin' Pegs.